Ready to feel at paradise right in your backyard? 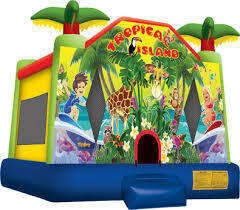 If so, then Tropical Island Bouncer is just the right inflatable for you. Completed with elaborate animal graphics, large palm trees at the top of the inflatable, and a huge bouncing area this will have everyone going bananas! With safety netting on all 4 sides for easy viewing/ protection and an inflated bed at the entrance/ exit your children will be having the time of their lives while bouncing the day away. For added fun, there's a bouncy basketball hoop inside! Rent the Tropical Island Bouncer for your next gathering to keep the neighborhood talking while making memories that'll last forever.